Who is Paul referring to in Colossians 1:15? Jesus Christ, of course: ὅς ἐστιν εἰκὼν τοῦ θεοῦ τοῦ ἀοράτου, πρωτότοκος πάσης κτίσεως. He is the icon – that’s the Greek word translated as image – of the invisible God. When we look at Jesus we see God. Not physically, for there is no physicality to God. God is spirit, Jesus told the Samaritan woman in chapter 4 of John’s Gospel. Jesus is the true icon/image of God in the sense that Jesus is everything God is. He represents God to us. He is the Word of God, the wisdom and power of God. But an icon or image is meant to have a viewer or witness; someone to receive and see the image – just as you are receiving and seeing the image that is attached to this email. We are the witnesses, the recipients of the “image”! When we honor him, when we listen to him, when we follow him as disciples, we are recognizing that he is the image of the invisible God. 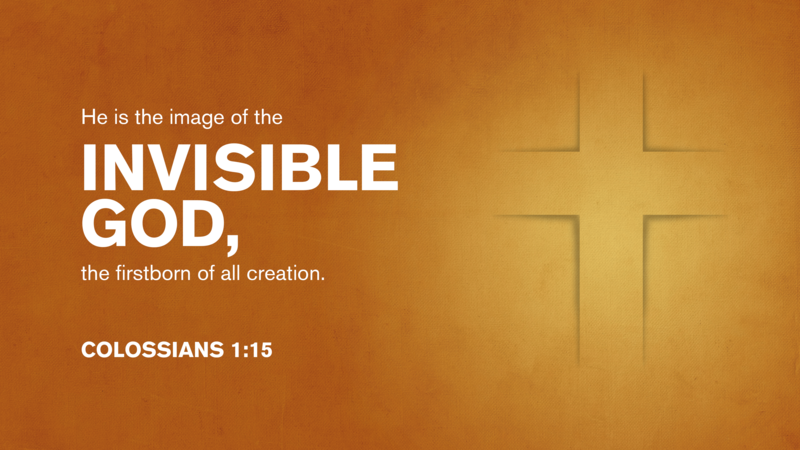 God who is invisible chose to become visible to us through Jesus Christ. Can you understand the profundity of that statement? For us and for our salvation, God became visible. Clearly Paul is not equating Jesus to Adam, nor is he implying that Jesus was the first of God’s created beings. Translating πρωτότοκος as the English word “firstborn” is misleading if we don’t go on to include the remainder of what Paul wrote: for in him all things were created, in heaven and on earth, visible and invisible, whether thrones or dominions or principalities or authorities—all things were created through him and for him. He is before all things, and in him all things hold together. (Colossians 1:16-17) This is a big statement that can sustain a separate email exposition. Just as in yesterday’s extraordinary paragraph in Colossians 3:12-17, so also here he sees the church as the place where everything finds its purpose. In chapter 3, the church is the body of Christ, where our discipleship has its true home, and from where we learn how to go out into the world as disciples and messengers of Christ. In the chapter 1 passage, Jesus Christ’s works of creation, re-creation and reconciliation (which is another word for cosmic salvation) all find their culmination and focus in the church. The church is all-important to Christ’s work. The church is the home of God’s purposes to save the world and bring us to glory. Is the church important to you? If yes, then how is it important to you? And how do you express that importance in your life and your participation in the life of the church? Categories: Bible Reflections, Biblical Explorations | Tags: Colossians 1:15 | Permalink.